The history of Blacktown Rugby begins way back in the Spring of 1960. It was then that people like Alwyn Lilly, Blacktown’s inaugural 1st Grade coach, and Jack Murray, the first President formed the Seven Hills Junior Rugby Union Club. Twelve years later one of those original juniors, Steve Jones helped to start a Seven Hills sub-district side. This team was to form the nucleus of Blacktown Rugby Club that joined the Sydney Third Division competition in 1979. The people mentioned previously, Alwyn Lilly, Steve Jones and Jack Murray were vital to the clubs formative years. While the club had the usual teething problems in its first year, it did manage to win the fourth grade premiership with the U/19 side. The team was coached by Frank Duck. They also had their first representative player in 1979, in past president, Bruce Fowler. The club prospered in subsequent years with second grade setting records when they won one game 156-0, scoring 30 tries in 1982. Blacktown also had further representative players with Daryl Carle, in 1980, and Stuart Lockard, in 1980, 83 & 84, representing Sydney Third Division. Blacktown continued in third division until 1986 when the club, through a lack of numbers joined the Subbies competition playing in the Jeffrey and Noice Cups and had immediate success. Both grades made the semi-finals with first grade missing out to Cammeray Northbridge, in extra time, in the grand final. The next year was to prove their most successful year. The first grade side were minor premiers and runners up to Rockdale in the Clark Cup while scond grade reversed the result beating Rockdale to win the Farrant Cup. Blacktown also won the club championship that year. These results gave impetus to progress into a three team competition and in 1988 the club contested for the first time, the McLean, Grose and Walker Cups and were semi-finalists in all grades and runners-up in the club championship. That year Blacktown also won the West Wyalong knockout competition for the first time. They have competed in these cups since that time. Second grade won the Grose cup in 1990. The club went through a bit of a lean period, results wise, in the 1991 and 92 seasons, although they did win the West Wyalong knockout again in 1992. They improved in 1993 with first grade winning the minor premiership and finishing runners up to Fairvale in the grand final. This was definitely a decade of expansion. The early part of the decade saw us struggle a bit for numbers, but the Warrior spirit and the commitment of the stalwarts – the Crowe, Casey and Lilly Clans pulled us through. The club made a concerted effort to expand and broaden the player base with active recruitment and increasing our exposure and profile by utilizing local newspapers, radio stations and billboards to advertise Blacktown rugby. We also actively promoted closer involvement with Subbies rugby committees, schools and other rugby clubs. We continued to improve our working relationship with our Juniors, the two clubs moving much closer to our objective of forming one rugby club. 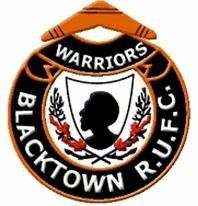 The Juniors changed their name to Blacktown Junior Rugby Club and in 1999, the under 14’s, 15’s and 17’s playing in the senior colours and their player enrolment ever improving are all pointers that we are moving in the right direction. Success on the field has been highlighted by Premiership wins in 1990, 1994 and 1997 as well as club championship and promotion through three divisions in five years. The playing strength of the club was helped by the introduction of the Halligan Cup competition and the re-introduction of Colts. In 1997 we fielded our first Colts team since 1985. The caliber of the Colts players, both on and off the field is a clear indication that Blacktown Rugby will grow from strength to strength. Sadly, this decade has seen the retirement from the playing ranks of a number of the “old boys”, Jeff Phillips, Stephen Goldsmith, Paul Wright, Wayne Crowe, Michael Casey, Mark Jarvis, Greg Proctor and Dane Glover to name a few, whilst other hard heads could not give up playing and decided to form the Stingless Warriors – our very own Golden Oldies side, Gil Goddard, take a bow! The Golden Oldies now gives us a true 7 to 70’s feel with the introduction of U/17’s moving a step closer to bridging the age gap, where we generally lose so many players. The club has continued it’s renowned reputation for our hospitality – and we continue to swamp other clubs in the time honoured boat races. Our social club membership and support has dramatically increased with the girls showing the way. Our reintroduction of the end of season trips, kids Xmas parties and regular social events all contribute to the expansion of the club and its family orientation. We have expanded the sub committee structure and the introduction of a marketing committee are all steps for the future. On the playing side our commitment to level 1 and level 2 caoching clinics and appointment of club coach will stand us in good stead for the future. We have consolidated our position in Division 2 and continue to strive towards playing rugby at the highest level possible. Where the hell does someone start to write the history of Blacktown Rugby. As one of the boys who succumbed to the bait offered by people like Alwyn Lilly and Jim Hooler, I formed part of the U/12 team of 1961. From this beginning came rugby in the area. The Seven Hills J.R.U. went from three teams (U/11, U/12 and U14) in its opening year to 8 teams – 3 years later thus laying the ground work for all future happenings. Premierships were won by some teams while others went seasons without winning at all over the next twelve years. The precedent of traveling to New Zealand to visit Kaiapoi was set and commenced in 1970. OK, so why is this the foundation for all things since. During 1972, a bunch of not so talented but very enthusiastic U/18’s approached myself and the Junior club about what they should do after they couldn’t play U/18’s legally (they were probably using false birth certificates that year). They believed rightly or wrongly that they would not receive a “fair go” at Parramatta Grade, so what else was there? Enter John Bell, the Junior club’s Treasurer who was prepared to initiate the enquiries which led to the nomination of a Seven Hills team in the C.S. Noice Cup Sub-District Competition in 1973. Although there were many who thought this is a good idea, few did much, so John Bell’s initiative was certainly a key. So who were the guys that played these six years in Sub-District – nearly all ex juniors. Players like Paul Delaney, Gary Matthews, Greg Matthews, Alan Blackmore, Rex Ryeland, Brad Skinner, Ron Claxton, Mark Lilly, David Lilly, Phil Hall, Peter Foster played many games in subbies before the commencement of the 3rd Division competition and in fact racked up many more games in the juniors. A dispensation that allowed Seven Hills U/19’s to play as our 4th grade. This was really successful as they duky won the first ever 3rd Division title as 4th Grade in the first year, playing staff like Koen, Carter, Cahalane, Morris and a superb skipper in Brad Campbell certainly helped. We had a second grade team who also played 4th’s for a lot of the year and got the U/19’s through to the Finals. But more, this second grade team showed the courage and determination week after week thus taking the pressure off the first grade. This courage allowed the first grade to achieve probably their greatest win ever at Thomas Mitchell Reserve on Saturday 12th May 1980, Blacktown beat Dundas Valley 12-9. Two great Chook Fowler tries had us leading 12-0 at the break and an enormous second half saw us hold them off. I recall lower grade training was virtually abandoned on the Monday due to the most of our voices being left behind in the Dundas Valley that day. So the early years of 3rd Division were negotiated with many highlights and memories of win or parties but just as many narrow losses and frustrations. In 1982, the second grade provided most of the highlights. In April they welcomed the Sydney – New Zealand’s claims to 3rd Division with a 104-0 win amongst wins by all other grades. In July, they repeated the dose by winning 156-0 including 30 tries. The 2nd XV went on to win 8 of their last 9 games to make the semi-finals (only our second team to make it). 3rd Division cam e to a shuddering halt in 1985 as the top 10 clubs decide to do their own thing (they loved promotion weren’t too keen on relegation). Well, Blacktown is now 21 years of age. 21 years since we ran onto the field with high hopes and aspirations to match up with the well established Mosman side for the first game of the 1979 season. What a start we had!!! Most players had to back up and play 2 game a week but the spirit in the club was tremendous. And the celebrations were mighty when our first grade had their first win, 12-9 at Dundas, with 2 tries going to our later 2 times president, Bruce “Chook” Fowler. He also became our first representative player that year winning a trip to Tasmania. It was a hard year but everyone enjoyed themselves and a new club and the Blacktown spirit was born. There have been many highlights over the years both on and off the field. On the field, we knocked off the previously undefeated Hawkesbury Agricultural College, when the rumour was that they had already had their undefeated jackets prepared. Our traditional battles with Kellyville, most Blacktown boys, were always looked forward to with relish. Joe Murphy’s “cop that” to Chipper is one that I will always remember. Stewart Lockard’s determination and fierce tackling led him to numerous representative teams. The willingness of older guys like Rex Ryeland and Roger Hines were always willing to put their bodies on the line. Jim Smith also provided many memories and I think on one day he won at least 2 cups, maybe 3. I also remember him delivering a don’t argue to a 6 foot 6 Dundas player that was as sweet a delivery as I have ever seen. There were guys like Kevy O’Brien, Myrtle, Bean, the Crowes, the Matthews clan, including Brad Skinner, my relatives, Foods, and a million others too numerous to name. Being a prop I remember the many times playing with Laney and Joe Murphy as well as Fatty and Walshie as hookers. One day when we were being flogged by Penrith, Joe, Fatty and myself decide to slow the game down by starting a brawl in the front row. Sure enough it erupted but Penrith scored anyway. The many games I played with mark Jarvis, Jeff Phillips and Warren Adamson are also firmly etched in the memory banks. I could go on with this forever but time marches on. The coaches deserve a special mention with the efforts of Alwyn Lilly and Warren Adamson standing out in my mind. In the newer generation, the first grade records of Steve Collins, Shaun Lilly, Shawn Bugg and Daniel Bevan have come to the fore. They are also excellent on the social side of the club. On that front Tunksies’ back, crack and sack, the flaming dunk and skull and the Golden Gutter award have gone down as aprt of club lore. The longevity of Goldie, Bernie Crowe, Mick Crain, Mick O’Leary, Neil Gledhill, and Grunter have been of great benefit to the club. The re-advent of the colts in the past few years shows that the new breed are taking over but they still have the Blacktown spirit. Off the field there have been 20 Talent Quests with acts like the Ruggettes, Fridge Full of Piss, Bruce the belly dancer, I say I say I say, Red and Bob, Tunksie and his million acts and the list goes on. We have had numerous Trivia and Karaoke nights and other social functions. Pricks of the year have come and gone but Jim Smith stands out again in this category. In on memorable year he brushed his teeth with dencorub, put the wife’s car through a caravan and hid his wallet in the old phone books, Tracey threw it out! Kay Goldsmith went down in history as the girl who won 2 domestic of the year awards with 2 different players. Goldie also made history by winning every award available in the novelty awards. There have been many, many bus trips but probably the most memorable one was when Red, still in his neck brace, was almost lost to us when the back window of the bus popped out during a rendition of Swing Low Sweet Chariot. Also, the end of season tours. Highlights were our early tour to Fiji, where we had our first international win over Naviti and where the airport authorities at Suva threatened to send us straight back to Sydney after a rambunctious flight into Fiji. It also took 2 days before Myrtle and Kevy knew they were in Fiji. Myrtle also gave the bus driver a surprise on our trip to the hotel. The other was Europe where the boys were runners up in the Oktoberfest Sevens. We also visited Ireland and the legendary Oktoberfest in Munich, where Sarge was the standout. All other trips were great as well with too many humorous moments to mention. All in all, I have enjoyed every minute with the Blacktown Warriors and I am pleased we have reached this milestone. Many thought we would not last in those early years but efforts from men like Alwyn Lilly, Steve Jones, Alan Gibbons, Stephen and Kay Goldsmith, John Casey, Doug Adamson and Neil Gledhill have kept the administrative side of the club functioning. I hope to be around for the next 21 years.